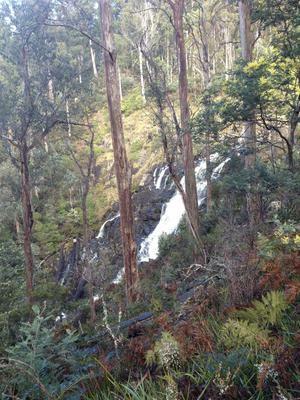 Last year we went away on a road-trip up the west coast of Tassie, seeing plenty of great waterfalls along the way, including Montezuma, Nelson, Waratah, Philsophers, Champagne and Bridalveil, Liffey, as well as Victoria Valley Falls. 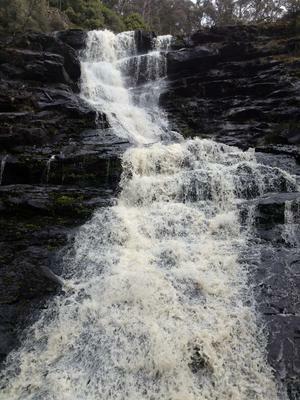 There was plenty of rain leading up to our trip, as well as on the first couple of days, which made for pretty miserable bushwalking but great waterfalls. Victoria Valley Falls was no exception. 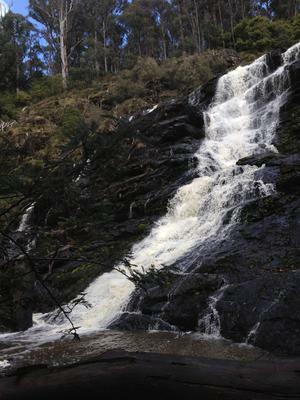 After embarking on a very short walk we arrived at the top of the falls, which was creating quite a roar. 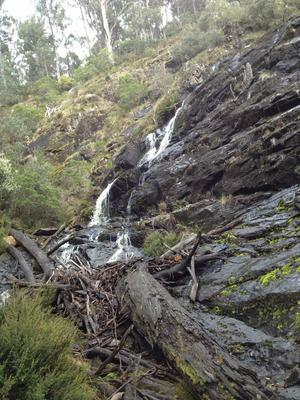 We continued on to try and find the lookout and perhaps the base of the falls. After a couple more minutes along the poorly defined track, it became clear that there hadn’t been any maintenance done on the track in a long time. It was a good thing that we could see the falls, or else it would have been easy to get lost. After a little while we gave up trying to follow the trail and I decided to try and embark on the steep scramble down to the bottom. As I did this, it became clear to me that this probably wasn’t the walk to wear my good sandshoes on. Luckily the falls didn’t disappoint, crashing down the cliff with some very impressive force. Even the smaller side waterfall had plenty of water. Photos really didn’t do it any justice, and made the falls seem much less steep than it really was. It would be interesting to come back here in the summer sometime when he water level is lower to see the difference, but as it was it was a very impressive waterfall.